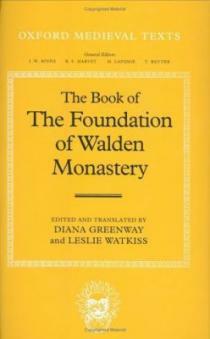 This account, from The Book of the Foundation of Walden Monastery, of the military actions of Geoffrey de Mandeville, Earl of Essex, during the reign of King Stephen. In 1143, Stephen imprisoned Geoffrey, forcing the earl to surrender various castles. Once he was released, Geoffrey went into open revolt, until he was killed in 1144, while besieging Burwell in Cambridgeshire. In the reign of King Stephen of pious memory, Henry duke of Normandy and count of Anjou made his appearance, who had by now been knighted by the king of the Scots, called David, a name worthy of a king. He himself was grandson of the elder King Henry, being his daughter’s son, and he was supported on all sides by many powerful forces both from the retainers of his father, Count Geoffrey of Anjou, and many from England. Consequently, great dissension in favour of the contending parties and distressing disturbances broke out at that time in the kingdom of England. There were frequent deadly encounters between knights, men died, cities and churches were burned down, property was ruined, lands devastated and everything imaginable plundered. It was during these evil days that Geoffrey, earl of Essex, a knight proven in battle, supported the king’s side for some time in most loyal service against his rival. But in the end, being maligned by some of the leading men in the kingdom, who were motivated by envy, he was falsely charged before the king, in secret, with being disloyal to the king and a traitor to his country. Not long after this a council was assembled at St Albans , and when the others had departed quietly this noble man, now alone, was deceitfully arrested at the king’s command and was prevented from leaving by guards chosen for the task. Although many of his friends who were indignant at such unjust treatment of him appealed to the king on his behalf, he was utterly refused permission to leave until he surrendered, albeit unwillingly, his fortresses. It was with fierce resentment that he surrendered the Tower of London, Walden, and Pleshcy; and so, completely bereft of his strongholds, he left at once. This high-spirited man, having been tricked, as has already been said, by the underhand treachery of men who wished him ill, immediately enticed to join him, by gifts and promises, a considerable number of battle-hardened knights; he added archers, and hastened to gather together from wherever he could other retainers of the same kind notorious for their crimes. Whereupon, like a strong, unbridled horse ready to maim with teeth and hooves any who stood in its way, he first assailed manors, villages, and other things belonging to the king’s estates, set them on fire, and then he lavishly distributed amongst his fellow-knights the not inconsiderable plunder stolen during his pillaging. At that time he brought over to England his sister Beatrice, who had been married in Normandy to Hugh Talbot but was now divorced, and joined her in a marriage contract to William de Say, a man of fierce, warlike temperament, upon whose aid he relied thereafter, and having become all the more terrible because of the large number of his knights, and rampaging everywhere throughout the whole area he vowed to spare nobody at all who was wealthy. He showed no respect or reverence for holy places, not even for churches themselves. His spies, disguising themselves, went around like beggars from door to door and observed villeins and other men of that kind who had been blessed by God with wealth. Once they had found out about them in this way, in the silence of dead of night, at a time previously arranged, these disciples of Satan were dispatched by the earl to seize innocent men at a time when they were fast asleep, and when seized to bring them to him with a view to obtaining a large reward. Then these men were soon severely ill-treated and tortured for some long time: the tortures were of various kinds, one after another, and went on for as long as it took for them to pay up the last farthing of the money demanded from them. While Geoffrey was thus engaged his anger exceeded human bounds, and he was so enraged that at the instigation of William de Say and a monk called Daniel, of false name and tonsure, he made for Ramsey by boat with his men. There in the early morning with careless audacity he first entered by stealth, and then invaded the church dedicated to God And the Blessed Father Benedict. He seized all the monks who were asleep after the night office, and though they were wearing only their plain habits, he immediately drove them out in confusion. Without delay he strongly fortified that most beautiful church, above and below, inside and out, not as a fortress for God but as a castle. He seized gold and silver altar vessels which had been consecrated to God, copes of the cantors interwoven with precious stones and of wonderful workmanship, chasubles with albs and other ornaments that adorn a church, and sold them off at a very low price to any who were willing to buy them, from which he paid the wages due to his knights and retainers. Subsequently, because of excesses such as these and many others like them, he incurred not undeservedly a public sentence of excommunication, and in this state, at the small castle of Burwell he received a fatal wound in the head. Then, fervently repenting, and with heartfelt contrition, pleading God’s forgiveness for his sins, he made satisfaction to God and man as best he could by dying in such a way, though he could not be absolved by those present. But when he was on the point of death and drawing his last breath, some Templars arrived on the scene who laid upon him the habit of their order marked with the red cross; then when he was dead, they took his body away with them, encased it in a lead waterpipe and hung it from a tree growing wild in their orchard at the Old Temple in London. This item is under copyright of Oxford University Press (OUP), 1999, and is used here only by permission of Oxford University Press. This entry was posted in Primary Sources and tagged 12C, England. Bookmark the permalink.